John Penrose, the local parson at Penryn in Cornwall, went to Bath in 1766 to take the waters for his gout. He was accompanied by some members of his family and they lodged in the Abbey Green, very close to William Orchard’s hairdressing business. Penrose wrote home frequently and his letters were preserved, transcribed and finally published in 1983 (Letters from Bath 1766-1767 by the Rev. John Penrose. Alan Sutton). On May 22nd 1767, the parson wrote to his daughter Margaret, mentioning amongst other things the current fashion for lady’s hair pieces: “Mr Orchard has orders to make a Roll for you and another for Mary, as near as he can, to match your respective Hairs”. He then went on to say that, should Margaret wish for something more elaborate, she could have some curls made in the Parisian mode; it seems probable then that the family patronised William’s establishment. With such a central position in the city, I imagine the business was rather successful. In the Bath Chronicle dated the 4th October 1787, under the fashion section, was the following announcement: “Wm Orchard, peruke maker, Abbey Green, Bath thanks customers & solicits the honour of their command in favour of his son under whose direction the business has been carried on for several years”. William was by this time sixty years old, or thereabouts. Obviously, Walter had been the mainstay of the hairdressing business for some time and William wished to retire. Less than a fortnight later, an announcement was made of Walter’s marriage to Miss Eleanor ALLEN, an event celebrated nearby at St James’ church in the Southgate. On 28th May 1789, William’s death was recorded; he was said to have been aged sixty-three. He left a will which, happily for me, survived and is stored at Somerset Record Office. Dated just four days before his death, the contents solved one mystery as the excerpt above shows. It seems that not only did the Orchard family own the Raven public house, as I had hoped, but probably also their own business premises next door. Whilst the Raven was left to his wife Mary, it appears that William had already gifted his portion of Abbeygate House to Walter as a marriage settlement. Walter continued the peruke making business and would seem to have maintained the reputable name of Orchard in the hairdressing world. Eleanor, Walter’s wife, developed her own sideline and advertised her ‘perfumery, pomatums and powders’, sharing the shop at Abbey Green with Walter who carried on hairdressing and peruke making. Of course, the two concerns fitted well together. Nonetheless, Eleanor proclaimed her removal from Abbey Green to ‘next door to Mr Hazard’s library’ on 4th December 1794. One can only hope that the separation was a happy one. Christopher Anstey (1724-1805) writer and poet. The ‘Poetical Register and Repository of Fugitive Poetry for 1803’ reproduced a witty sonnet by the well known satirical poet Christopher Anstey. He had written an ode to his wigs Malus, Pejor and Pessimus, all of which were made by Walter. Anstey was saying a sad farewell to his three old friends in 1795 whilst gaining some comfort from the thought that they might yet provide a useful service atop a scarecrow, helping to protect his cereal crops. The intended irony of this was that the powder used to whiten wigs of the day could be made from corn and wheat flour. 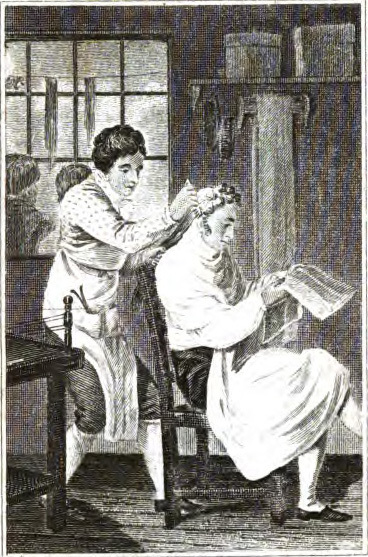 It may be no coincidence that Anstey had set his hairpieces aside in 1795 because in that year, an Act of Parliament was published entitled ‘A Duty on Hair Powder’. From the 5th May 1795, anyone wishing to use wig powder had to visit a stamp office, give their name and pay for an annual certificate costing one guinea. Perhaps this tax was an attempt to offset the rising cost of grain following the failure of cereal harvests in the previous couple of years. 15 April 1797 Walter Orchard is to be declared bankrupt. In any event, the tax must have damaged Walter’s business considerably and so it is not surprising that in April 1797, he was finally declared bankrupt. He seems to have picked himself up and recovered though, taking on his own son, William Henry as an apprentice. The stamp tax was paid on 29th December 1797 when his boy was just nine! Walter died on the 4th February 1837, aged 85 years, just three days later than his sister Ann, who died as a spinster aged 88 years. William Henry inherited the hairdressing business in Abbey Green and obviously prospered. By middle age, William Henry Orchard was a gentleman and ‘proprietor of houses’, according to various census and trade directory entries. He and his wife lived for at least twenty years in Great Stanhope Street, a rather pleasant rank of Georgian townhouses. They died within a few months of each other in 1873/4. Their estate was worth about £15,000 in today’s money. Next time, an entirely different branch of Orchards who were Quakers, Methodists and Baptists and travelled to America taking their faith with them. This entry was posted in Individual and tagged Abbey Green, Christopher Anstey, John PENROSE, peruke makers, The Raven, Walter ORCHARD, William ORCHARD. Bookmark the permalink. You mention in a previous blog about a Ridout having lived in Maltkln Hill Farm, Horsington. I now live here so can confirm its very much all still here. Would be interested in hearing more about the people who lived here long before us. Hi Emma… thank you for visiting my blog and making a comment (they are few and far between!). Things are a bit busy here right now in the holidays but, when the dust settles, I will see what I have on Maltkin Hill and write a proper reply to you. I visited Sherborne last year and saw Limekiln, Hyle and West Mill – quite a stange experience after having researched and written so much to see the area in reality. I like Sherborne very much but I didn’t quite as far as Horsington. Another time perhaps 🙂 Watch this space!